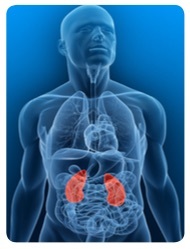 Kidney injuries in sports are rare. The kidneys are located above the hips one on each side of the spine. As a result of a violent impact to the flank (side), a kidney may rupture. Blood in urine following blow to their side. The bleeding often stops spontaneously and causes no further problems. If the injury is severe, and bleeding continues, surgery may be needed to repair or remove the kidney. After sustained, vigorous physical exertion without impact, a small amount of blood can appear in the urine, causing a faint red discoloration. This does not necessarily indicate a kidney injury, but should be assessed by a doctor.